From Go-le-ta to Santa B. There seemed no point in adding entries for 3:35, 3:45, 3:55, 4:25 as they can rhyme the same as 3:25. Similarly there seemed no point in mentioning the 4:00, 4:10, etc. groups as they match the similar 3 hour groups. I couldn’t find a rhyme for 3:40 except naughty, and I didn’t like the implications of that. A little after mile 2 on Los Carneros there is a short sharp rise to go over a bridge that crosses 101 freeway. And when going up Cliff my pace tends to slow by about 2 minutes/mile. Today was a 13 mile marathon pace effort. By mile 3 I was alone. At times my mind would divert itself by bastardizing poetry. At other times it concentrated on running hard enough. The amount of carbon produced by the US has dropped slightly in recent years because we are burning more natural gas (methane) and less coal than we used to. I am interested to see just how much of a difference this makes. Wikipedia lists the heat of combustion of various fuels, which is an approximation to the amount of energy that can be extracted from those fuels. The interesting question is: For a given amount of energy output, how much carbon will be put in the atmosphere? The actual amounts are immaterial to me, I’m interested in the relative amounts, so I arbitrarily am using 1 Mega-Joule as a reference. So switching from coal to methane while producing the same amount of power would reduce carbon output to 13.5/29.2 = 46%. If we fueled our cars with methane (somehow, rather than gasoline) that would reduce carbon output to 13.5/17.9 = 75%. Now the IPCC said back in 2007 that if we wanted to keep warming less than 2°C we would have to reduce our annual carbon production to ~15% of then current production by 2050. A reduction to 46% is nowhere near enough. Doubtless many have argued that 46% is better than nothing, but the problem is that once you build a power plant it tends to continue working for decades, thus many plants built now will probably still be working in 2050. The decisions we make now will keep us from doing what needs to be done by then. If we were actively pursuing solar, wind, geothermal on a large scale then building the occasional natural gas fired power plant would not be a problem. But currently natural gas seems to be looked on as the main solution — and it isn’t. Of course some of these leaks can probably be fixed, and various states are attempting to require this. This will be the fifth running of the Santa Barbara International Marathon, but in a sense the race is much older than that. It just died out in 1984 and wasn’t resurrected until 2009. In 1965 John Brennand and Mike Kimball were race directors for the first Santa Barbara Marathon and at the time it was one of only six annual marathons in the US (preceded by Boston, Yonkers, Culver City, Heart of America (in Columbia MO), and San Diego). The course started at UCSB went out to Ellwood and finished at City College. The gun went off at 3pm with a temperature of 84°F — of the 27 starters only 17 finished. Yet in spite of the heat 2 of the 17 broke 2:40:00, 7 of the 17 broke 3:00:00, and only one person, a 59 year old, took longer than 4 hours. Most runners were relatively fast in those days. During the 60s the AAU did not allow women to run races that were longer than 2 miles. As might be imagined women were not very happy about this. The Road Runners Clubs put on “non-competitive runs” to avoid this ban. And sometimes women just rebelled. An unofficial starter, Lyn Carman, 29 was not expected to withstand the travail involved in negotiating over twenty-six miles in this hilly course, but to the astonishment of every male competitor, Lyn finished strongly breaking 4 hours. The wife of the 12th place finisher, Bob Carman, Lyn trains with her husband once a day running from 30 to 60 miles weekly, with 1 to 2 days on the road, and the remainder on track or grass. A mother of four children, with her youngest being 13 months old, she shyly accepted the acclaim, bereft of an appropriate award for such a feat. Splits: 42:32 at 5 miles, 1:45:39 at 11 miles and 3:57:50.9 at the finish. Another young lady, Mrs. Roberta Gibb Bingay, completed the Boston Marathon, 4-19-66 to place 124th in the unofficial time of around 3:21:25. Such precedents inevitably will remove the barrier that discourages official competition for women in distances over 1½ miles. The directors had learned something from the first year, and in 1966 the race started at 8am with cool overcast weather. The runners were faster too, with the winner running in 2:26:23 and 12 runners under 3 hours (and all runners, including Lyn, under 4 hours). There were 19 finishers (including Lyn). Over time the race became more popular growing from 17 finishers in 1964 to 76 in 1969 and peaking with 354 in 1977. Thus coinciding with the first running boom in the US. 1978 has almost the same number of finishers, but by 1984 the number had dropped to 114. And it was at that point the John Brennand, race director, decided there was no longer any reason to hold a marathon in SB. The numbers were still dropping, and there were now plenty of other marathons elsewhere. 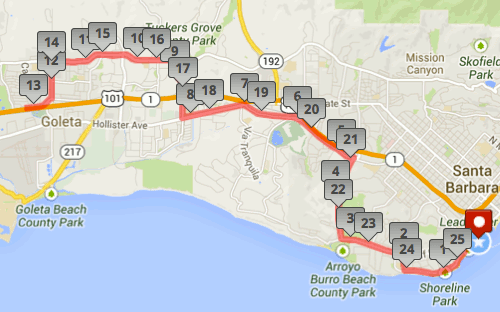 The race was not revived until Rusty Snow restarted it as the Santa Barbara International Marathon in 2009. There were a few races in the intermediate years which called themselves “Santa Barbara Marathons”, but none was associated with the SBAA (and so they don’t count). The most interesting of these was run on 1 April 1995 and started at the intersection of 154 and Camino Cielo. It went out Camino Cielo to Gibraltar, down Gibraltar, along Mountain Dr, wandering through Montecito and finished near Butterfly Beach. Not only was 1977 the peak year for the marathon, it was also the first year for the SB Half Marathon. This race did not die, but continued and prospered after the marathon ended. In 1996 the News Press started sponsoring the half and it became the Santa Barbara News Press Half Marathon. In 2009 the first Select Staffing SB International Marathon and the last SB News Press Half Marathon were run on different dates; but in 2010 the half also became the Select Staffing SB International Half Marathon. In recent years about 10% of our runners have qualified. In the past the percentage was higher.